It looks pretty damn good! Lovin the paint job and can’t wait for a more in depth review. I knew those pieces had something to do with the seating area! Wow I love it!!!!!!! Any idea when in May it will be on sale..?? 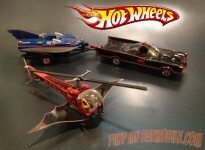 Move it over General Lee…the BATMOBILE is comin through! I want 2! One will become a slot car. The other I WILL BUILD! Their sales page now says May…and June?? Is this going to be moved again and again?? Lol..just can’t wait!! Thanks, I look forward to getting one…or two!